Hot summer nights call for cool desserts! 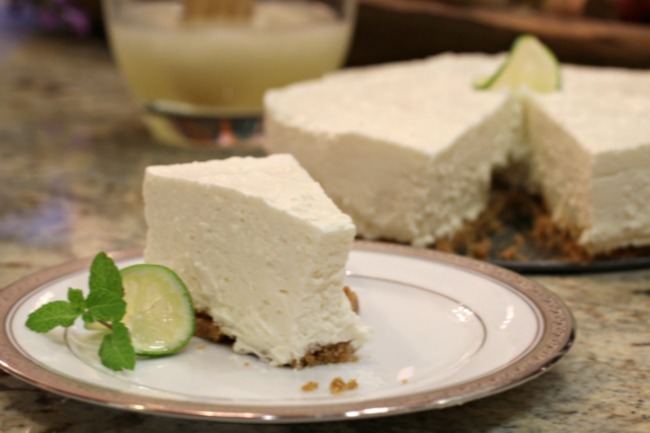 This icebox lime (or lemon) cheesecake, found on page 201 of River Roads Recipes II, A Second Helping, is a great way to finish any meal. Make it ahead of time (it needs to be refrigerated for twenty-four hours before serving) and bring it with you to your next dinner or work party. Everyone is sure to enjoy, and it will be our little secret just how easy it is to make! Combine ingredients and pat into a spring form pan or a 15×9-inch baking dish, forming a crust. Dissolve jello in boiling water, then cool. Cream together cream cheese and sugar. In a large bowl whip chilled evaporated milk until stiff. Add cheese mixture, vanilla, and jello. Pour into crust and top with a few reserved crumbs. Refrigerate for 24 hours. Take advantage of the summer season’s fresh lemons or limes to use as garnish to add a pop of color to this cool, creamy classic! Add a sprig of mint to really wow your guests. If you like this recipe, be sure to check out our delicious Lemon Cream Pie from River Roads Recipes IV, Warm Welcomes.